Fujitsu has crafted an impressive Android ICS tablet and, whether for business or pleasure, this is a decent buy. After Fujitsu's unimpressive tablet debut with the business-focused Stylistic Q550, we weren't holding out much hope for the Japanese company's follow-up, the Fujitsu Stylistic M532. As it turns out, we needn't have worried. Fujitsu has executed a complete U-turn and given us a tablet that can compete with heavyweights such as the Toshiba AT200, Asus Transformer Pad 300 and Samsung Galaxy Tab 10.1. Although the Fujitsu Stylistic M532 is aimed primarily at business users, Fujitsu has dropped the Windows 7 operating system of the Stylistic Q550 and opted for Android this time around. There could be no other way. Although Windows 7 offers by far the widest number of business applications, its performance on a tablet compared to Android is like comparing Sunday league football with the Premier League. Not only is the Fujitsu Stylistic M532 offering Android 4.0 Ice Cream Sandwich right out of the box, it also has an Nvidia Tegra 3 processor tucked inside running the whole show, 1GB RAM, 32GB SSD storage and an 8MP rear-facing camera. So, when it comes to performance, Fujitsu has certainly made sure the Stylistic M532 has got the minerals. This device is aimed at taking on the top tier of Android tablets, and the price reflects that. 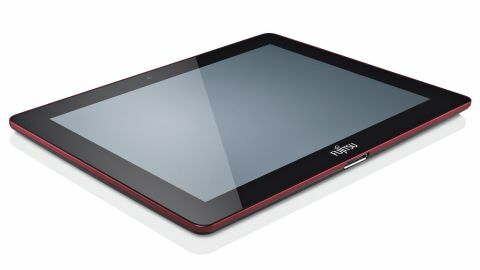 Although the Fujitsu Stylistic M532 has yet to be released, Fujitsu told us to expect a full retail price of £476 (around $745), which puts it competitively among the likes of the Galaxy Tab 10.1 and the Asus Transformer Prime, not to mention the new iPad. Of course, the real question remains: is it worth it? Well, we've spent some serious time with Fujitsu's new baby in order to find out exactly that. Fujitsu has opted for a 10.1-inch form factor with the Fujitsu Stylistic M532, and has kept the chassis down to a pleasingly slim 8.6mm (0.34 inches). That's as thick as the Samsung Galaxy Tab 10.1, and the new iPad - at 9.4mm thick - is portly by comparison. Luckily, there's no hidden weight anywhere, and the Fujitsu Stylistic M532 tips the scales at only 560g (1.23lbs). In one hand this weight becomes noticeable after a time, but if you're using both it's light as a feather. The back of the tablet has been given a soft, rubberised plastic coating, similar to the one found on the reverse of the BlackBerry PlayBook. This doesn't look as attractive as the aluminium of the new iPad, or even budget machines such as the Disgo 9104, but we can't argue with the functionality. The rubbery black coating is easy to grip, and you won't find it getting covered with smudgy fingerprints, either. That's just the screen. There's only so much you can do with the aesthetics of a tablet, but Fujitsu has thrown a little of its trademark red onto the Fujitsu Stylistic M532 by way of a trim around the outside. The jury's out as to whether this cheapens the look of the tablet, but in our opinion it adds a good design touch that helps to differentiate it from the legions of similar devices. Thanks to Android 4.0's soft key arrangement, there aren't any physical buttons on the front of the Fujitsu Stylistic M532, and this really helps make it look better. The bezel isn't tiny, but then it isn't massive either – just big enough for the Fujitsu branding at the bottom of the tablet and the front-facing 2.0MP camera lens at the top. In fact, the only buttons you'll find on the entire tablet are the on/off switch on the top of the device and the volume up/down on the right-hand side. Below the volume controls is the micro USB port and space for a micro SIM card and microSD storage expansion. Yes, that's right – the Fujitsu Stylistic M532 features both 3G connectivity and microSD storage. These are two features often overlooked on the majority of tablets, and the fact that Fujitsu has included them is enough to merit a slow, appreciative nod of the head on our part. Even without the microSD card, you still get 32GB of SSD storage inside the Fujitsu Stylistic M532, which is generous for the price. The only other connection, besides the 3.5mm headphone jack, is the Fujitsu proprietary port on the base of the tablet, used for charging and the like. The hope is that, à la Apple, we might see some docking stations and other peripherals that take advantage of this before the year is through. Given that the screen is about the most important part of any tablet, how does the Fujitsu's hold up to scrutiny? Quite well, as it happens. The 10.1-inch Gorilla Glass display has a 1920 x 1080 pixel resolution and excellent viewing angles. All the .MOV, .AVI and .MKV files we threw at it played perfectly, and we were able to settle down for a couple of hours with several HD episodes of Game of Thrones. However, as ever, the glossy screen ran into trouble when we watched in bright light. And although the brightness on the Fujitsu Stylistic M532 can be boosted, it wasn't enough for outside viewing. Even so, you'll get a lot of viewing time from the Fujitsu Stylistic M532. Fujitsu quotes the lithium polymer battery inside the tablet will give you 9.5 hours of usage. We streamed HD video continuously from a full charge until the tablet gave up after 283 minutes. Given that streaming video is a demanding task, especially with full connectivity and performance settings, you should be able to get longer from this tablet with more conservative use. The power itself comes courtesy of the aforementioned Nvidia Tegra 3 quad core processor and the 1GB of RAM that keeps Android 4.0 running smoothly – but more of that on the next page.